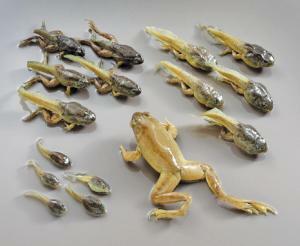 Observe the bullfrog tadpoles in various stages of development with this specimen set. The set includes five tadpoles with no legs, five tadpoles with two legs, and five tadpoles with four legs, as well as one 4–5" adult bullfrog. The set of 16 is packed in a single pail with WARDSafe.